A sample of decorative goods made by the Faberge jewelers, in addition to the eggs for which Faberge is best known. 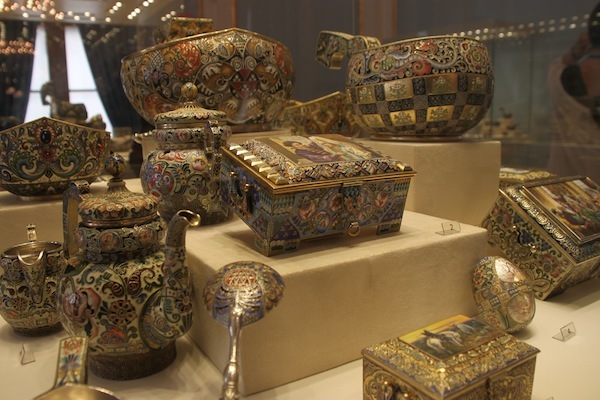 These items are on display in the Faberge Museum, which is on St. Petersburg’s Fontanka River Embankment. ST. PETERSBURG, Russia — It wasn’t intentional, but Russia’s tsars and the aristocracy bequeathed to the public a large assortment of royal residences in and around St. Petersburg. Some are shoo-ins for the tourist circuit, including summer palaces such as Peterhof and Catherine Palace, discussed in a separate article, and the Winter Palace (part of the Hermitage Museum). Others are less known, but one emerged from obscurity in 2013 and is sure to be a hit with visitors, not because of the palace (which is gorgeous, BTW), but because it houses the Faberge Museum. I visited the museum less than a year after its debut while on a press trip sponsored by the St. Petersburg Tourism Committee. Our itinerary took in other former palaces, too. As to our sightseeing, the following will appeal to widely varied interests. It took seven years to restore the 19th century Shuvalov so it could house the Faberge Museum. Interior of the Shuvalov Palace, which houses the Faberge Museum in St. Petersburg. 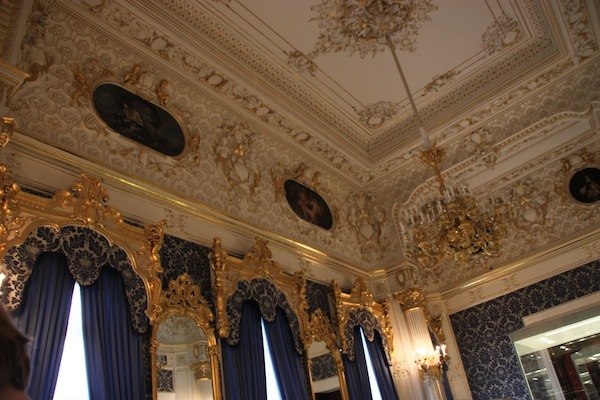 The famed eggs are in this room, notable for walls covered in blue silk with a silver design and the very ornate gold gilt molding that tops off the room, literally. 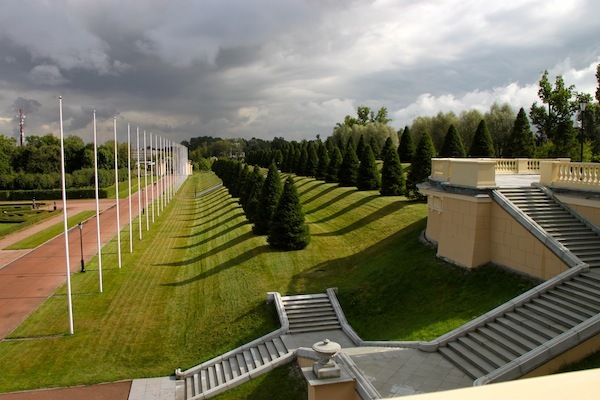 The museum, a private operation, was the brainchild of Russian entrepreneur Viktor Vekselberg, whose collection the museum’s displays are based on. His idea is to restore to Russia treasures that were lost to the country during the Soviet period. Vekselberg began the process by purchasing the late Malcolm Forbes’ collection of Faberge eggs and other items. After Forbes died, his sons had put the package up for auction. That was 2004, and the price tag was $120 million. More treasures have been added and now there are 4,000 items on display, made by Faberge and other specialists. 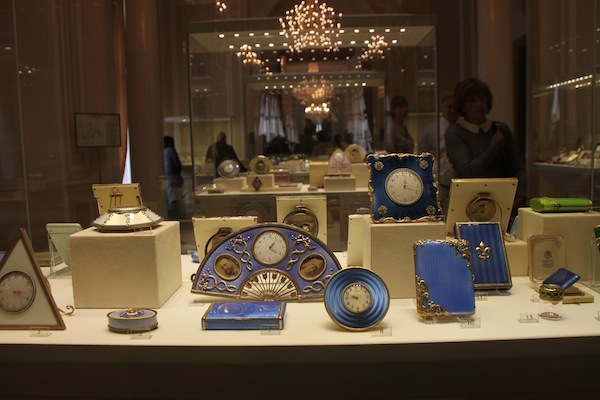 Examples of the very expensive trinkets commissioned by the upper classes in tsarist Russia. Expert artisans other than Faberge made these items, seen in the Faberge Museum. The museum has 13 Faberge eggs, nine of which belonged to the tsars, including the first (1885) and the last (1916) egg made for the royal family. Faberge made 50 eggs for the family. 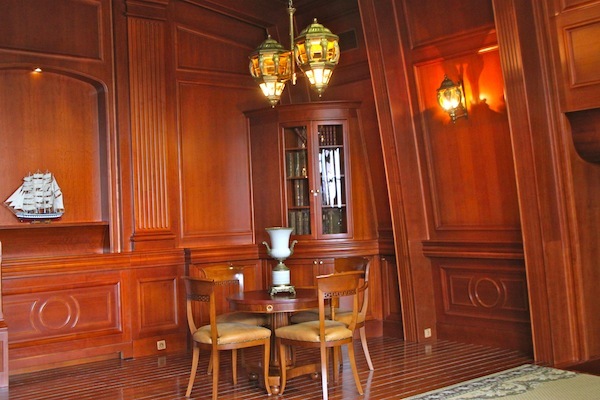 In addition, display goods include icons, jewelry, silver, paintings and a range of other personal and household items indicative of the lifestyle of the rich and connected in tsarist days. The palace itself, with gilt molding, richly colored silk wall coverings and a truly grand entry staircase, is a good indicator, too. Visitors can rent a book with information about display items to use if touring the museum without a guide. The 150-ruble “rent” (between $4 and $5) is really a deposit and refundable. Now the property of St. Petersburg’s teachers’ union, this palace won its place in history because the “holy man” Rasputin was murdered here in 1916. The killers were the young Oxford-educated Prince Felix Yusupov and a number of coconspirators who believed Rasputin’s influence over Tsar Nicholas II and his family was dangerous. Yusupov’s wife was the tsar’s niece. 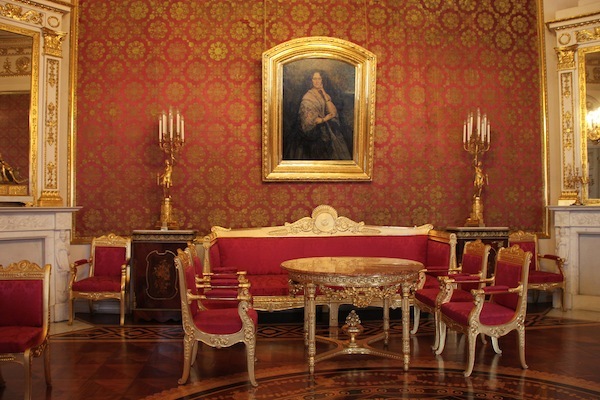 The Red Reception Room in the Yusupov Palace, which is located on the Moika River in St. Petersburg. On our tour, our guide led us into a Yusupov living room to view a diorama of Felix’s conspirators. We then visited a basement diorama with Rasputin at the table and the young Felix standing nearby. 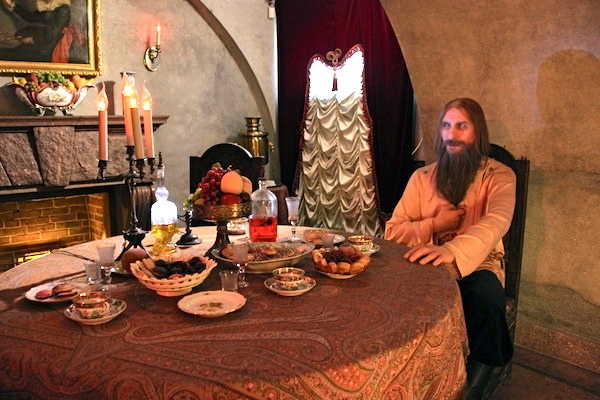 Diorama in Yusupov Palace illustrating the Rasputin figure in the basement at the time when he had been eating poison — to no effect. Rasputin had been lured to the palace believing he would meet Felix’s wife. During the wait for this supposed encounter, Felix fed him poison-laced food, to no avail. Felix later shot him. We also had a short tour of some rooms used by Felix’s parents. Builders of this 1910 home used interesting building materials. The paneling in the tapestry room is plaster, but it certainly doesn’t look like it. And, in the palace’s big ballroom, the large chandelier is 32 kilos (70 pounds) of papier-mache while smaller light fixtures are 10 kilos (22 pounds) of papier-mache. 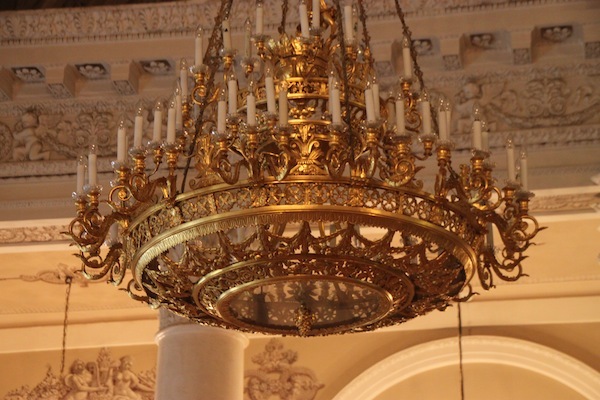 The 70-pound papier-mache chandelier in the ballroom at Yusupov Palace. The palace has a menu of visitor fees covering a variety of experiences, such as a fee for seeing the Rasputin diorama in the basement, another for seeing the younger Yusupovs’ private apartment, etc. There was a rather stiff photo fee (more than $4), and this was the one place in St. Petersburg where the fee was barely worth it. I had never heard of this one. Essentially, Constantine Palace — except for its outer walls — is a reconstruction. It is an official state residence and a business center. The entry point for the restored Constantine Palace, located in Strelna, a St. Petersburg suburb on the Gulf of Finland. It dates from 1720, but has been abandoned for more than half its existence. During World War II, it was reduced to a stone frame. Restoration took 18 months in 2000 and 2001. 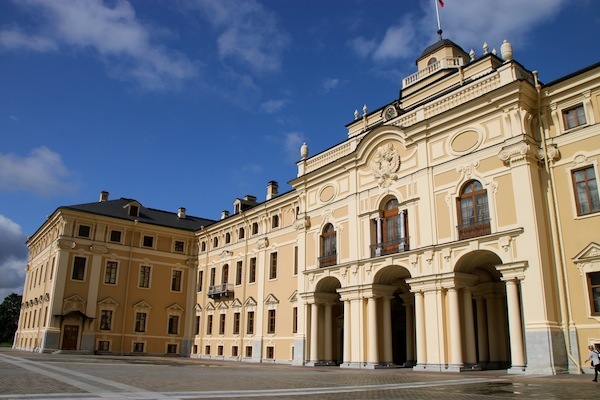 Located in a suburb called Strelna, the palace offers a variety of regular tours, except when it is in use for state business. 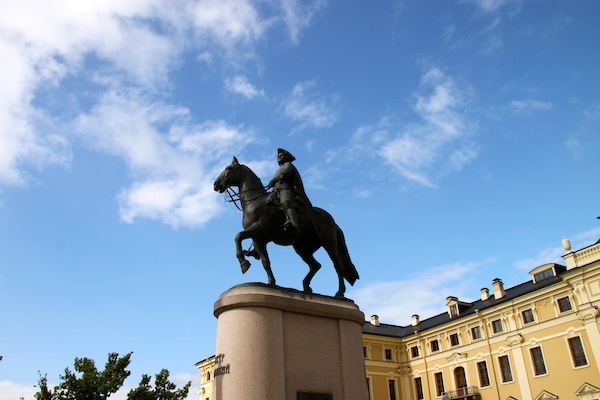 This is a stately and pristine reconstruction of an 18th century palace, especially on the exterior, with a broad plaza at the front centered with an equestrian statue of Peter the Great. Statue of Peter the Great standing in front of the Constantine Palace. The palace was conceived and construction started while Peter was tsar, but he gave more attention to Peterhof. Another broad plaza at the back overlooking formal gardens and a system of canals. Grounds of Constantine Palace, with some of its broad exterior staircases in view. A central canal leads from the palace to a modern meeting pavilion, designed to harmonize with the 18th century style of the main building. The Gulf of Finland is just beyond the pavilion. The canals can be used for boating. 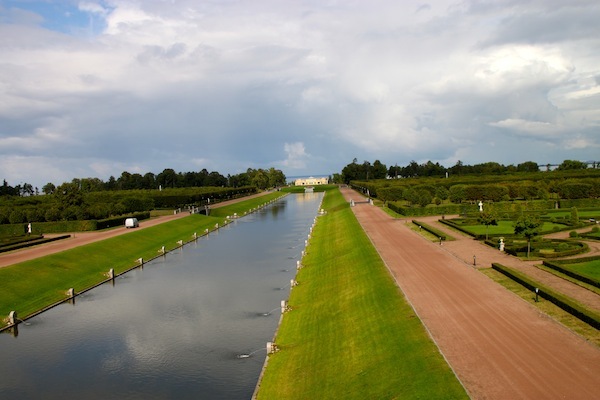 The canal at the back of Constantine Palace that stretches to a modern meeting pavilion seen in the distance, with the Gulf of Finland behind it. Formal gardens are at right. As to the interior, the west side is the president’s side, and the east side is for VIP guests, but there are no bedrooms. There are meeting spaces and event spaces. President Vladimir Putin and all guests stay in 20 new cottages on the grounds, and these are very big cottages! Private space for the Russian president, seen in the Constantine Palace. Putin always stays in a specific cottage, which is never available to anyone else. The other 19 can be rented when the government isn’t using the property. There are approximately 17,000 bottles of Hungarian wine in the cellar, a gift from Hungary, but Putin’s drink is beer. A young couple using the Constantine Palace and its grounds as a backdrop for wedding photos. This article and its photos are by Nadine Godwin, the author of Travia: The Ultimate Book of Travel Trivia, which was published by The Intrepid Traveler.